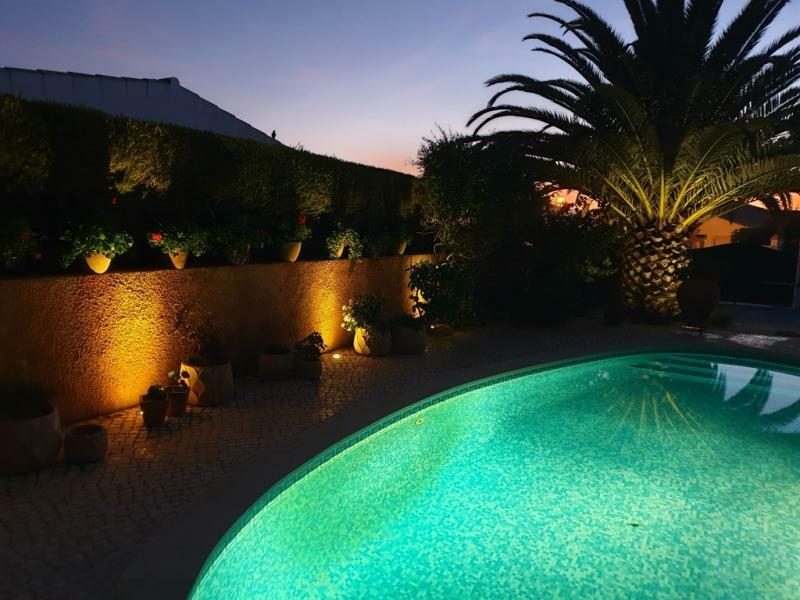 Modern 3 bedroom villa with swimming pool and a lovely garden set in a manicured urbanization in Montinhos de Luz. Set in a quiet area with a lot of privacy, this is a great opportunity to purchase a bright and spacious family home designed to maximize indoor and outdoor living. The property has been recently decorated and it is well presented with a large terrace, an excellent pool area, barbecue area, different sitting areas through throughout, all this surrounded by a beautiful landscaped garden with flowers all year round, water feature and lighting for enhancing it's beauty at night time!. The villa consists of an entrance hall leading to a brand new open kitchen with marble worktop and quality appliances. The spacious living room with a closed fireplace gives you access to the covered terrace through large French windows. There is also a guest toilet and a laundry/utility room on this level. On the first floor there are 3 double bedrooms, all with fitted wardrobes and having access to a large south facing balcony overlooking the garden and the pool area. One of them is an en-suite and the two others share a family bathroom. Entrance of the property is through an electric gate with a Portuguese Cobble driveway and a Carport. Further features include: double glazing, Daikin air conditioning system installed, gas central heating radiators. Built with attention to details, this villa offers a fantastic opportunity for full-time living and holiday rentals.